Hi everyone! The holidays are fast-approaching and we’re kicking off the season of giving with PlayStation Store’s month-long Holiday Sale, featuring a new lineup of game and video deals each week. Starting right now, save up to 75 percent on games like Borderlands: The Handsome Collection, EA Sports UFC 2, Tom Clancy’s The Division Gold Edition, as well as films like the Hobbit Trilogy, Trainwreck and more. PlayStation Plus members save up to 80 percent. Check out the breakdown of Holiday Sale Week 1 titles below and let us know what makes your list. 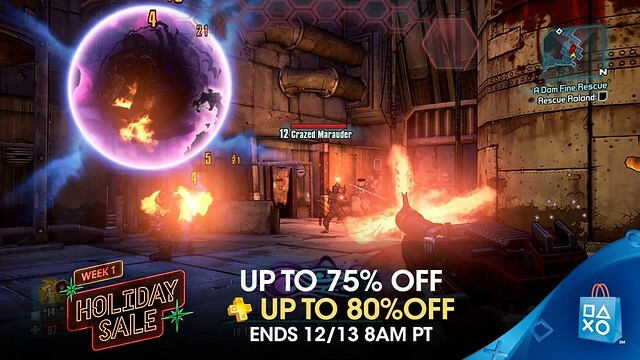 Week 1 of PS Store’s Holiday Sale runs through Monday, December 12th. Check back next Tuesday to see what Week 2 has in store! Update: Certain sales titles were listed in error. This post has been updated to more accurately reflect PlayStation Store offerings. Prices still a bit high. Interested in UFC 2, Technomancer, Vermintide, and Catlaterral bc of VR. Perhaps Sportsbar VR as well. Anyone with PSVR needs to buy Bound. It’s perhaps the best looking VR game, particularly with PS4 Pro. Not a thing for me. Kinda hoping for another spend $x get $x promo so I can preorder a game. Arkham Premium, Bound, Sportsbar VR, Catlateral, Vermintide, Civilization 2, Oceanhorn, and Ethan Carter are great deals. Already own those in which I am interested, so waiting other 3 week sales! If this is indicative of weeks to come, My wallet is going to be hurting. Picked up act it out and need for speed. Great sale! Don’t like any of the games on this week 1 list as i have played some or own em. Secondly hope other 3 weeks have better deals (closer to Christmas) and none of these games are repeated in the other weeks. How about a sale on SingStar content? Maybe some free holiday tunes? AXIOM VERGE (Cross-Buy PS4/Vita) is 50% off. $10. MUTANT MUDDS DOUBLE PACK is $10. Includes 2 games: Mutant Mudds Deluxe and sequel Mutant Mudds Super Challenge. Nothing for me, maybe next week. Regular prices on games, especially for us Canadians, is pretty ridiculous… and most the of the sales have been pretty lackluster this year. No one buy Chivalry Medievil Warfare! I bought it and there is no one playing it. Can’t get a single game going. Also, it’s not optimized well either. Waste of $8. Got necrodancer though.. Hope Enter the Gungeon is on sale next week for about $7. Could you tell me… Why is it that European PSN has a proper Christmas sale, but all you say is this generic Holiday word? What is it that makes you afraid to say Christmas in America? I mean, Europe is a place filled with many creeds and faiths as well, but I don’t see you hiding behind a generic term there. This war on Christmas is so ridiculous. @BuffaloNugget It’s probably because we now live in a world where everything has to be politically correct. Had Sony used the word “Christmas” instead of “Holiday”, SJWs will complain that Sony is shoving Christianity (a religion that Christmas has ties with) down the throats of Jewish people (who celebrate Hanukkah), African American people (who celebrate Kwanzaa), etc. 1) Most African-Americans celebrate Christmas. 2) There are just a lot of holidays at this time of the year, and as far as I’m concerned, the holiday season goes through New Year’s Day. 3) There are many wars going on. “On Christmas” is not one of them. Christmas is everywhere here, from Christmas songs, to Christmas trees, to Christmas decorations, to Christmas stuff on sale months before Halloween, to everything. It’s an insult to actual wars to claim there’s a phony war on Christmas going on. 4) Care about something worthwhile. Every Christmas, the people who complain are always people who are triggered when they see the word ‘holiday’ (ironic considering there’s a user next to me talking about SJWs and people offended). Hopefully seeing the word holiday is the worst thing that happens to you today. It isn’t so much anymore about being Politically correct. it is about making it easier to market your sale. Sure you could have a Christmas sale, then a Hanukkah, then a Kuanzaa sale, then another for anything else in there. You could also just do a Chrihanuzaa sale. It is far easier to just put them into one term, that even includes New years. “Holidays”. Sure make it easy to market, yes, a side effect could be less offensive. Just an easier term. Good call, BuffaloNugget. I looked up the Playstation Europe Blog and you’re of course absolutely right. They have 12 Deals of Christmas. I find it equally ridiculous too and a turn-off. I respect other holidays that are celebrated during December, but ultimately Christmas is the most celebrated holiday in December in America. (Heck, even Japan, the native home of Sony, likes to have not holiday parties in December, but Christmas parties.) I’m no fan of Trump, but the cumulative anger that many feel at having to live in a culture where you can’t express yourself for fear of offending someone is part of a larger lashing back that’s responsible for his rise. It’s amazing that we can’t have a ERA for women, but other much more recent cultural practices get sanctified. Gotta add some love for BLAZBLUE: CHRONO PHANTASMA EXTEND being on sale this week. It’s a great fighting game, unlike the more recent Central Fiction, which dropped the English dub that was part of the series. So if you like deep fighting games and/or high quality visual novels (which is essentially what the story mode is), BB:CPE would make a great early Christmas gift. Please do not mention “trump” on this blog. We hear enough about him already everywhere else. This is for gamers talking about games. Political ideology can go elsewhere. Good day. 3 more weeks of sales at least. Received a $50 psn card for my birthday from my brother. For Canada, just NHL and Divinity (same usd/cad price) that are decent. The rest is no better than retail, and the movies are a diarrhea dump in the ear. Why no Christmas kids/family movies? I guess there will be more upcoming but the available Christmas stuff is not great. For anyone wondering about kingsglaive because you got ff15, the free hour anime on square’s Yotube channel “brotherhood” is essential. Kingsglaive probably not so much. -$6 off my psn card still an ok cg movie. Ubisoft deals are a joke, $25 retail Canadian for AC Syndicate. Sorry Ubisoft you have become bottom tier. Yeah, the extra 30% for Canadians makes the sales a little less attractive. Makes you gauge whether to wait for a sale after a price drop or hope it comes out on plus (yes I like indies) but a 40% discount on a $20 indie game is better than the Canadian version of 40% off a $27 game. Or how $40 becomes $54 for newer vita games before sale prices. Or $60 becoming $80 for new PS4 releases. While I understand the added price due to $exchange, it doesn’t mean I have to like it or ignore it when it comes to purchasing. Makes me appreciate my PS+ backlog all the more when I need something new to play while I wait for price drops next year on the newer titles. Older PS3 games should be getting permanent price drops. Sell them for dirt cheap and sell a ton. They are digital with absolutely no costs to the seller. Why not cash in by selling as many as you can? Right? I still have a Ps3 and i want them to finally have some blowout sales! Nothing for me this week, well, theres three more yet. Dishonoured GOTYE is not the price you’ve listed it’s $20.99 da fauq? I would say welcome to Sony Canada. Can we finally get external hard drive support for the PS4? Now that most games are taking up at least 60 GB, I’m continually having to install,delete, reinstall games. I love that with my Xbox 360 I can have all my games, hundreds of them, all on one location…and I can play any one of them whenever I wish. Put a 2tb hard drive in mine and my son’s, really easy. Best money I ever spent, plus it’s much nicer having it internally. Cost about $89 each, Samsung/Seagate is best. Hmm kinda hard to admit that but soon PS3 and Vita won’t even have any sales anymore…the last ones were poor just like this 1st week of the holiday sale plus in this sale PS3 and Vita have close to no games on sale compared to PS4.What a shame Sony what a shame…there are still a lot of games I would like to see on sale for PS3. It’s like as if now that they are done with the PS3 they just don’t want our money anymore. If they still has regular sales, I’m sure i’d still buy games for it almost weekly. It’s defiantly a miss opportunity…! How about a Watch Dogs 2 sale or a % off $100 sale? Purchased Overlord: Fellowship of Evil for $7.04 which felt like a good sale to pick up a new co-op game to try. Just wondering but what games are people buying in the week 1 sale?? Any chance that weeks 2, 3 or 4 will get better deals? God of War:Chains of Olympus was one of the UMDs I got when I bought my first PSP back in… FIIK (I only really wanted a portable Sega Genesis and PSP/Vita is the correct choice even in 2016). Good game, but I’m not going to pay for it again. hey, at least I have three more weeks for this, right? Is it worth picking up TALES OF ZESTIRIA? PORT HOT SHOTS TENNIS TO PS3!!!!!!!!!! PLEASE CMON! I really hope each Season Pass from the Pinball Arcade for PS4 goes on sale. They never seem to go on sale on the PSN. Especially as their was/is no transfer from PS3 to PS4 only a discount on Season Pass 1. Season Pass 2-5 is still $160 and no cross-buy feature either. Need for Speed was a great deal, I picked that up this week along with BroForce (also a fun game with friends). Looking forward to see what’s coming out tomorrow. Any clues? so when does week 2 start? Any chance of encore sales? I had three games in my cart last night that said they were on sale until this Friday. After working long hours yesterday I didn’t log in and finish the transaction, was just gonna do it this morning. Log in this morning to see they are all back up to full price. Hey I wanna buy skyrim but I’m afraid that it will be on sale one of these weeks for like 35 bucks like last time then I just wasted 20 bucks should I wait? UNCHARTED 4 HAS BEEN OUT SINCE MAY.NO SALE. Cant find anything I like. They’re all repeated multiple times. Yep, same games every week plus not even very good sales. Any rumors on what might be in today’s drop?